Bond prices soared, sending yields lower, as traders shoved money into lower-risk investments. The S&P 500 lost 63 points, or 2.3 percent, to 2,727. The Dow lost 574 points, or 2.2 percent, to 25,253. The Nasdaq fell 197 points, or 2.7 percent, to 7,244. Bond prices rose sharply. The yield on the 10-year Treasury fell to 2.92 percent. The S&P 500 lost 61 points, or 2.2 percent, to 2,729. The Dow lost 536 points, or 2.1 percent, to 25,292. The Nasdaq fell 197 points, or 2.7 percent, to 7,244. Stock indexes fell in midday trading on Wall Street, giving back much of the market's gain from the day before. Apple lost 2.2 percent and Bank of America slumped 3.7 percent. The S&P 500 index lost 23 points, or 0.9 percent, to 2,766. 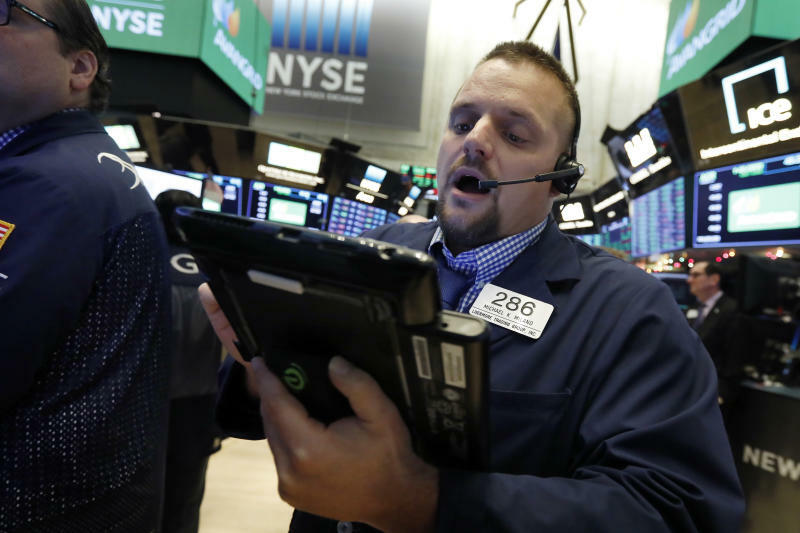 The Dow Jones Industrial Average fell 211 points, or 0.8 percent, to 25,611. The Nasdaq composite gave up 84 points, or 1.1 percent, to 7,356. Bond prices rose. The yield on the 10-year Treasury fell to 2.94 percent. Apple lost 1.7 percent early Tuesday and Bank of America was down 1.3 percent. Dollar General sank 5.6 percent after reporting weak results. The S&P 500 index lost 8 points, or 0.3 percent, to 2,782. The Dow Jones Industrial Average fell 65 points, or 0.3 percent, to 25,761. The Nasdaq composite gave up 33 points, or 0.5 percent, to 7,407.